Located on the tranquil and secluded beach of Playa Bejuco, we´re just a 2-hour drive from San Jose (between Jaco and Quepos/Manuel Antonio) on the Central Pacific Coast of Costa Rica. The Delfin is a recently restored Costa Rican landmark featuring luxury accommodations with beachfront rooms less than 40 meters from the Pacific Ocean. Amenities include air conditioned rooms with ocean view balconies,TV, hot water, Internet access, swimming pool, jacuzzi, and nature trail. 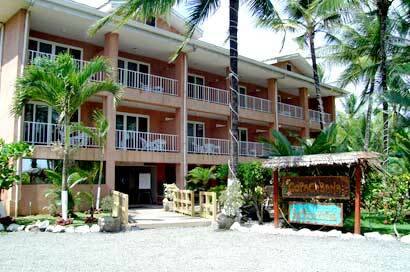 Treat yourself to the tranquility and comfort of Delfin Beachfront Resort. If you are looking for a clean, modern, moderately-priced hotel in the center of Jaco with lots of action nearby and close proximity to the beach, we invite you to come visit the Bar and Hotel OZ. Built in 2003, this hotel is an architectural work of art and has a breezy, cool sports bar and restaurant on the first floor. Come and enjoy a nice dinner, a few drinks, play pool or darts and watch your favorite game in our sports bar. Jaco Beach is the closest beach resort city to San Jose and the central valley and has long, wide open sandy beaches with excellant surfing spots. There is a wide variety of shopping, restaurants, bars, tour operators etc. to choose from. 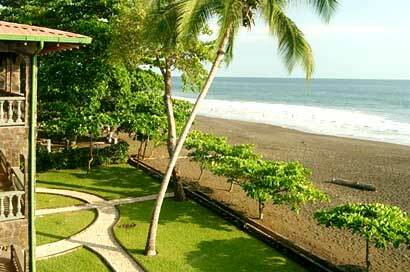 The Backyard Hotel is located on the central Pacific coast of Costa Rica in Playa Hermosa, 4 kms south of Jaco Beach. This tropical paradise boasts one of the country's most well-known surfing and sunbathing beaches. 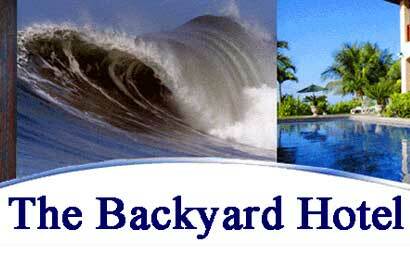 The Backyard offers you luxury accomodations in a spectacular ocean-front setting. Your ocean-front room or suite overlooks the Refugio de Vida Silvestre National Park and has breathtaking whitewater views of the Pacific Ocean. Playa Hermosa has some of the most consistent surfing in the country and is centrally located to the best beaches and activities on the Pacific coast. Costa Rica Surfing is known throughout the world as a premier location for consistent waves year round, good people and awesome parties. We are located in front of one of the best peaks in the area and are a few minutes from Boca Tulin, Roca Loca, Playa Escondido, Jaco and many other famous breaks.Or take adrive and follow the break. You can be at breaks from Puntarenas to Estirillos, Boca Damas or Playa Rey within a half hour. But when you stay here, you won't need to drive to surf, just grab your board and paddle out! Catch the break right out front. No driving or hassle required. This is a place where other surfers (and the babes) come, stay and hang out! It is here, amidst 5 tropical acres that you'll discover a remarkable array of vacation amenities unrivaled anywhere in Costa Rica, a small boutique hotel with rooms, suites, villa type condominiums and penthouses nestled next to a spectacular beach for surfing. Contemporary and secluded, this tranquil beachfront hotel offers a gracious respite from the daily whirl. Nestled in the rainforest by the sea, our intimate hotel echoes the natural beauty of its rural setting. Here guests are pampered with comfort, privacy and peace. 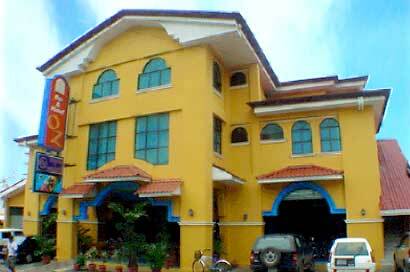 Nearby is a championship golf course and world class marina and much more. Best of all, it's available all in one resort destination... Marea Brava Beachfront Suites and Villa’s in Playa Hermosa, Costa Rica. Come, be our guest. Stay a week, a month or a lifetime. You'll soon discover that staying at Marea Brava Beachfront Suites and Villa’s is more than just an extraordinary family vacation experience... It's an opportunity of a lifetime. 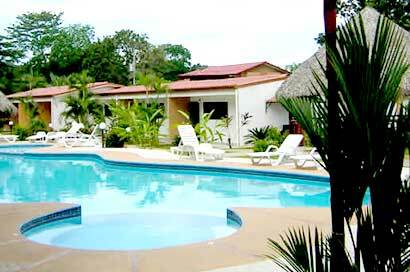 Congratulations, you have just come to the only Hotel & Resort in Jaco that offers exactly what you are looking for. 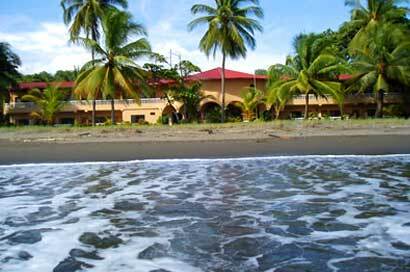 A beach-front resort located on Costa Rica's, Jaco Beach. 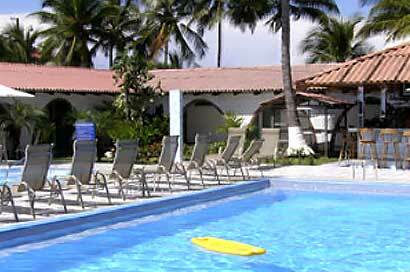 The Copacabana Hotel & Suites is the most popular, friendliest, relaxing, laid back, ocean-front beach resort in Costa Rica today. Location, Location Location...this tropical paradise offers something for everyone! Come and relax on the beach or take in the view from our one-bedroom ocean front suites. Enjoy a cool dip in the pool with swim-up to the sports bar for a cold refreshing drink or lunch or sit in our new hot tub. The Copacabana Hotel & Suites is always a lively place and our friendly atmosphere makes this a great vacation destination, to spend a fun-filled day, or party in our very popular beach front bar, or the famous pool side bar in the evenings or after hours. It's not just our job...it's in our nature. The enthusiastic staff are most dedicated to making your stay an enjoyable and memorable one. The motto at the Copacabana is, to ensure your stay with us is fun, safe and secure, giving our valued guests the comfort in knowing that we will do, "Whatever it takes" to help make your vacation the best ever. Crowning a towering mountain skirted by luxuriant jungle, Villa Caletas commands a breathtaking view of sea and sky. It is an inspired fusion of design styles - tropical Victorian, neo-classical, French - but it is so much more… What would in most earthly places seem to be an impossible jumble of disparate elements is here at Villa Caletas magically metamorphosed to harmonious beauty. Welcome to Villa Caletas, a luxury hotel "Close to Heaven" that shines like a jewel among resorts, prized not only for location, design and décor, but also for outstanding facilities and service. Come experience paradise. Inspired by French-Colonial architecture and the style of Victorian homes still found in San José, Costa Rica, our hotel exudes old-world charm. Villa Caletas expresses a truly unique combination of mountain and seaside resort. Looming 1150 feet above the Pacific Ocean, Villa Caletas shines like a jewel among resorts. The spectacular 180-degree panorama from this tropical-jungle perch sweeps over the gulf islands of the Nicoya Peninsula to the crescent beaches of Jacó, Herradura and Punta Leona, taking in the majestic mountains. Located just 90 minutes from San Jose, you can treat yourself to rest and relaxation on some of the finest beaches in Costa Rica. At our Hotel you will find yourself surrounded by tropical Costa Rican rainforest. Take a walk along our pristine white sand and gold sand beaches, while looking out into the deep blue waters of the Pacific. You will be swept away by the natural beauty found in our private rain forest, amidst which our beach resort is located. Golfers will find a championship course nearby at which to play. Adventure seekers will find a canopy tour within the resort. Enjoy the pleasures of life and book your reservation today! The vacation you have been waiting for is here. Please write to us and let us know how we can make your time in Costa Rica the adventure you are looking for. You may also be interested in our romantic Costa Rica Wedding and Costa Rica Honeymoon services... enjoy a unique Costa Rica beach wedding at one of Costa Rica's Central Pacific Coast most beautiful white sand beaches! 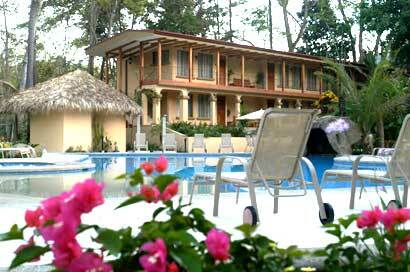 Welcome to Docelunas Hotel, Restaurant and Spa, located in Costa Rica's scenic central pacific region. We are a four star hotel and pride ourselves in making the Docelunas experience one you will never forget. Docelunas is an eco-friendly hotel and we believe in the importance of sustaining this beautiful environment. Our unique 20 room hotel lies on 5 beautiful acres nestled amongst the foothills of Playa Jaco. 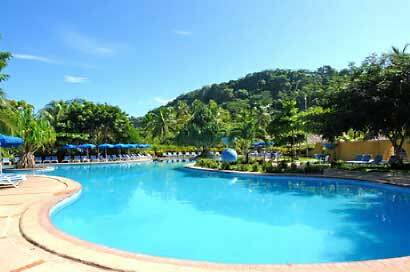 Surrounded by rainforest covered mountains, and rolling hills, you won't believe how tranquil it is. Our restaurant "Eclipse" is open for breakfast lunch and dinner daily. Relax and rejuvenate at our Spa, take in a YOGA class or shop in our boutique. We guarantee you one of the nicest vacations you have ever experienced. You will love our unique free form pool and won't believe the variety of animals, flora and fauna in the area. Over 400 species of bird call this area home and 150 of those have been seen on the property itself. We have planted butterfly and humming bird gardens on the property and toucans, monkeys and scarlet macaws can be observed feeding on our many fruit trees. At Hotel Cocal and Casino, we know the importance of understanding the needs of our guests and we make every effort to insure your stay with us is a memorable one. Each of our guest rooms offer security boxes, room service, air conditioning, patio and daily maid service. In addition, we have 24 hour security and private parking. It's time for some fun with Jaco's longest established Casino. Try your luck at blackjack, Caribbean poker, roulette or the slot machines. Sports book open for betting on all sporting events. Our air conditioned Casino with complimentary beverages and continuous music, make Hotel Cocal's Casino a perfect place to meet for a day of excitement. Take a break from the sun and have a beverage in our sports bar where you can watch a game via satellight on our big screen TV's. Hotel Cocal is the only hotel in Jaco offering beach front fine dining. Listen to the waves crash along the shore as you enjoy a bottle of wine while watching the sunset over the Pacific. Give us a call or send us an e-mail if you have any questions about vacations in Costa Rica and the Jaco Beach area or if you need a “live” fishing report.